Selective breeding may have produced a beautiful variety of dog breeds, but it has also left many with a legacy of genetic disease. To combat this trend, Cornell researchers have launched the Cornell Estimated Breeding Value (EBV) website through which the public can find the propensity for a hip and elbow dysplasia (malformation) of over a million individual registered purebred dogs and designer dogs, such as labradoodles, in the public domain of the Orthopedic Foundation for Animals (OFA) registry. The first such public resource in the United States, Cornell's Estimated Breeding Value database will help owners, veterinarians, and breeders care better for existing dogs and make better breeding decisions to improve the health and hardiness of future puppies and each breed as a whole. "We are providing an opportunity to improve selection and heath of pure breed dogs, for breeding and purchasing, based on their genetic potential for important qualities like good hip and elbow conformation," said Dr. Rory Todhunter, an orthopedic surgeon at Cornell's College of Veterinary Medicine who launched the site with his colleagues. The site provides estimated breeding values and the accuracy of the estimate derived from statistical models that combine dogs' pedigree relationships with OFA Hip and Elbow Scores, which are available in the public OFA Database (OFFA.org). 95 percent of the purebred dogs registered in the public part of the OFA hip and elbow database are on the Cornell site. 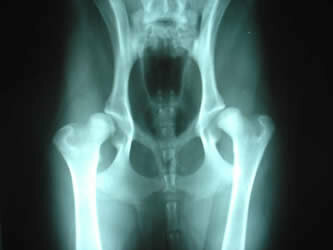 Since the OFA registry began in 1974, it has paired radiographs of dogs' hips and elbows with information from their pedigrees to estimate their propensity for hip and elbow dysplasia. These debilitating malformations are the most common complex orthopedic conditions in dogs with incidences ranging from less than 10 to over 70 percent across pure breeds. Owners and breeders go to veterinarians to get dogs certified as free of dysplasia at two years of age. They send the radiographs to the OFA and get back a score and can decide whether to allow it to go into the public domain, in which case it would be accessible by Cornell's site. "We call EBV scores ‘estimated breeding values' because you can't identify the genetic quality from appearance alone," said Todhunter. "Just because radiographs look normal doesn't mean a dog doesn't carry the mutations. A dog can have genetic propensity but look normal, but if you breed it with others you might see the problem in the next generation." That's where combining pedigree information with hip and elbow scores comes into play. With this combination and a large data set, Cornell's site can statistically derive an estimate of a dog's genetic quality. Beyond hip and elbow scores, the registry also contains some information about other conditions, such as patella luxation and thyroid and cardio conditions, and other qualities, such as color and behavior. "People have been doing this in animal and plant breeding for the last three or four decades," said Todhunter. "When people breed cattle, pigs, poultry, and plants, they do so based on the same statistical methodology we're using. The United Kingdom is the only other country to our knowledge considering such a searchable public database for Labrador Retriever dogs. Germany has the capacity. In Sweden, you can't breed a dog unless its hip info is in a public registry. Gathering and using genetic information this way will benefit breeds in the long run. This tool puts us one step closer to making healthier individuals." Anyone can access Cornell's site after a brief free registration. One can search for individual dogs by registered name, American Kennel Club registration number, or OFA number. Beyond individual data, there is a synthetic mating button that allows users to choose two dogs and the algorithm calculates the likely genetic quality of their hypothetical offspring. The site also provides educational material about EBVs, how they are calculated, and frequently asked questions.